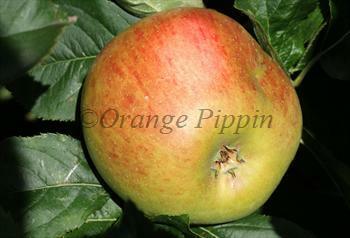 Blenheim Orange is a popular large English heritage apple variety, widely grown in gardens. It has the characteristic orange flush which is often associated with English apples. Although it can be eaten fresh, it is best considered a culinary apple, and it cooks to a stiff puree. Blenheim Orange makes a good feature tree in a larger garden. Please fill in the details below and we will let you know when Blenheim Orange apple trees are back in stock. A traditional English dual-purpose apple, a good alternative to Blenheim Orange. Blenheim Orange is in flowering group 3. Blenheim Orange is a triploid variety and cannot pollinate other varieties. It needs to be pollinated by another tree of a different variety nearby. You can either plant a self-fertile variety (which will pollinate itself and the Blenheim Orange) or you can plant two pollination partners which must each be of different varieties and able to cross-pollinate each other as well as the Blenheim Orange. If you need further advice on this just get in touch. Since it flowers in the middle of the blossom season it can be pollinated by most other apple trees. Blenheim Orange produces a large vigorous tree, with unusually dense wood. It is a triploid variety so it needs two separate pollinating apple trees nearby. This is slow-growing long-lived variety which takes a while to get into its stride. Victorian author Hogg, writing at the end of the 19th century noted that Blenheim Orange noted, "... when it becomes a little aged, it bears regular and abundant crops". Blenheim Orange is believed to date back to early 18th century. It was discovered at Woodstock in Oxfordshire, and named after the nearby Blenheim Palace. The parentage is unknown.